Pasta is such a versatile ingredient, you can just toss just about any saucy dish on it which turns it a complete meal, like this post today. The sauce was inspired from my mom’s Chicken ala King recipe, I just removed the starchy element that makes it thick instead we reduced the liquid and use parmesan cheese and the starch from the freshly cooked pasta go give body to the sauce. How about you do you have any dishes that you sometimes use with pasta? If you do please share it below. 400 g thin spaghetti, vermicelli pasta or angel hair pasta. Cook your pasta according to packet instructions, drain then set aside. Do not rinse with water. In a pot melt the butter then add the chicken pieces, once browned using a slotted spoon remove from chicken from pot then set aside. Using the same pot sauté onion and garlic. Add the chicken pieces back together with the mushrooms and cook for 2 minutes. Add chicken stock, milk and cream, then bring to a simmering heat. Add the capsicum, nutmeg and sherry then gently simmer for 8 minutes. Add the freshly cooked pasta and parmesan cheese, mix until pasta is coated evenly with sauce. Love this! Great idea to remake an old classic into something new and lighter. This is wonderful — thanks. I love pasta dishes. It’s so easy to incorporate whatever you have on hand. 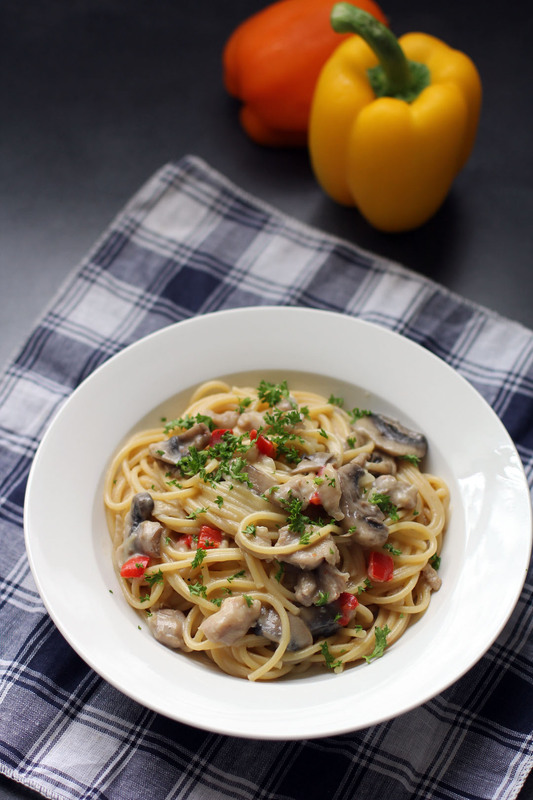 Always a winning combination – chicken and mushrooms – Raymund. 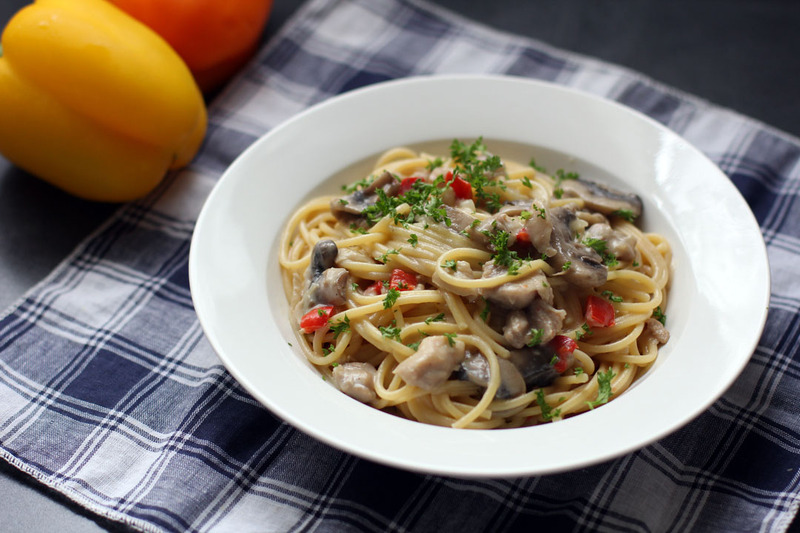 I love a creamy pasta concoction and this chicken & mushroom dish is no exception! We’ve actuslly jumped backwards in the weather dial to 12C here in Sydney, so I might be pulling some comfort food dishes soon!!! I heart the bajinkas out of creamy pasta dishes. Especially when it has chicken & mushies in it. Its a go to recipe in my household. Quick & delish. 🙂 Like Alice said, its been flippin freezing, Canberra got down to 2 degrees (with snow on the mountains #weatherwhiplash) the other day, had to crack out the slow cooker again. I’ll cook this oldie but goldie again stat. Awesome pasta dish Raymund!! I’ve been having a pasta craving lately and this one has just become the chosen one. 🙂 Already on the list for a meal this week. Thanks!